Storm is a real time, open source data streaming framework that functions entirely in memory. It constructs a processing graph that feeds data from an input source through processing nodes. The processing graph is called a “topology”. The input data sources are called “spouts”, and the processing nodes are called “bolts”. The data model consists of tuples. Tuples flow from Spouts to the bolts, which execute user code. Besides simply being locations where data is transformed or accumulated, bolts can also join streams and branch streams. Storm is designed to be run on several machines to provide parallelism. Storm topologies are deployed in a manner somewhat similar to a webapp or a XAP processing unit; a jar file is presented to a deployer which distributes it around the cluster where it is loaded and executed. A topology runs until it is terminated. Beside Storm, there is a Trident - a high-level abstraction for doing realtime computing on top of Storm. Trident adds primitives like groupBy, filter, merge, aggregation to simplify common computation routines. Trident has consistent, exactly-once semantics, so it is easy to reason about Trident topologies. Capability to guarantee exactly-once semantics comes with additional cost. To guarantee that, incremental processing should be done on top of persistence data source. Trident has to ensure that all updates are idempotent. Usually that leads to lower throughput and higher latency than similar topology with pure Storm. Basically, Spouts provide the source of tuples for Storm processing. For spouts to be maximally performant and reliable, they need to provide tuples in batches, and be able to replay failed batches when necessary. Of course, in order to have batches, you need storage, and to be able to replay batches, you need reliable storage. XAP is about the highest performing, reliable source of data out there, so a spout that serves tuples from XAP is a natural combination. Depending on domain model and level of guarantees you want to provide, you choose either pure Storm or Trident. We provide Spout implementations for both - XAPSimpleSpout and XAPTranscationalTridentSpout respectively. XAPSimpleSpout is a spout implementation for pure Storm that reads data in batches from XAP. On XAP side we introduce conception of stream. Please find SimpleStream - a stream implementation that supports writing data in single and batch modes and reading in batch mode. SimpleStream leverages XAP’s FIFO(First In, First Out) capabilities. SimpleStream works with arbitrary space class that has FifoSupport.OPERATION annotation and implements Serializable. Now we would like to create a reference to stream instance and write some data. The second argument of SimpleStream is a template used to match objects during reading. If you want to have several streams with the same type, template objects should differentiate your streams. Now let’s create a spout for PageView stream. To create a spout, we have to specify how we want our space class be converted to Storm tuple. That is exactly what TupleConverter knows about. At this point we have everything ready to build Storm topology with PageViewSpout. ConfigConstants. 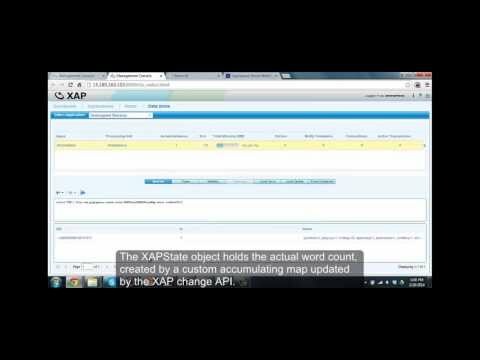 XAP_STREAM_BATCH_SIZE is a maximum number of items that spout reads from XAP with one hit. XAPTranscationalTridentSpout is a scalable, fault-tolerant, transactional spout for Trident, supports pipelining. Let’s discuss all its properties in details. For spout to be maximally performant, we want an ability to scale the number of instances to control the parallelism of reader threads. There are several spout APIs available that we could potentially use for our XAPTranscationalTridentSpout implementation: - IPartitionedTridentSpout: A transactional spout that reads from a partitioned data source. The problem with this API is that it doesn’t acknowledge when batch is successfully processed which is critical for in memory solutions since we want to remove items from the grid as soon as they have been processed. Another option would be to use XAP’s lease capability to remove items by time out. This might be unsafe, if we keep items too long, we might consume all available memory. - ITridentSpout: The most general API. Setting parallelism hint for this spout to N will create N spout instances, single coordinator and N emitters. When coordinator issues new transaction id, it passes this id to all emitters. Emitter reads its portion of transaction by given transaction id. Merged data from all emitters forms transaction. For our implementation we choose ITridentSpout API. There is one to one mapping between XAP partitions and emitters. Storm framework guarantees that topology is high available, if some component fails, it restarts it. That means our spout implementation should be stateless or able to recover its state after failure. When emitter is created, it calls remote service ConsumerRegistryService to register itself. ConsumerRegistryService knows the number of XAP partitions and keeps track of the last allocated partition. This information is reliably stored in the space, see ConsumerRegistry.java. Remember that parallelism hint for XAPTranscationalTridentSpout should equal to the number of XAP partitions. XAPTranscationalTridentSpout works with PartitionedStream that wraps stream elements into Item class and keeps items ordered by ‘offset’ property. There is one PartitionStream instance per XAP partition. Stream’s WriterHead holds the last offset in the stream. Any time batch of elements (or single element) written to stream, WriterHead incremented by the number of elements. Allocated numbers used to populate offset property of Items. WriterHead object is kept in heap, there is no need to keep it in space. If primary partition fails, WriterHead is reinitialized to be the max offset value for given stream. ReaderHead points to the last read item. We have to keep this value in the space, otherwise if partition fails we won’t be able to infer this value.